I moved back to Portland for grad school and to hopefully live here forever. Portland, along with the entire state of Oregon with all its special perks, is an endearing and exciting place to live thus inspiring me to put together an Oregonian Brew and Bites pairing dinner. I created this menu using a wide range of Oregon beers, pairing them with locally grown foods and incorporating the beer into the food whenever possible. This dinner was held at my residence in Portland on a Saturday evening and my guests were all Portland State MBA classmates. Since I was going on the local theme, I invited a range of interesting classmates: a sustainability expert, a fermenter (home brewer and baker), an arts and crafts whiz/foodie, and two classmates from abroad (Kazakhstan and Ecuador) who had no idea there was such a thing as "Oregonian food." We started off with a homemade lavender ricotta and blueberries on a herb baby greens mix with fruity olive oil. Lavender goes great with bright lemony flavors so I paired this dish with probably Oregon's most famous beer, Widmer Hefeweizen out of Widmer Brewery in Portland. I used lavender from Sundance Lavender Farm in Salem, my #1 source for culinary lavender. Blueberries are also local to Oregon and go fabulously with lavender so I put them together on a bed of an herb salad mix, topped with fruity olive oil. For the second course, I made a Greek yogurt beer bread using Rogue Brewery (Newport, OR) Hazelnut Brown Nectar and whole wheat flour. Hazelnuts grow everywhere in Oregon so it was a necessity to incorporate them into its very own pairing and not just as a salad topper. I used whole wheat flour as opposed to white flour to bring out the nutty flavor and further enhance the hazelnut aroma of the beer. I made two types of butter for slathering: a roasted hazelnut with Oregon sea salt butter and a chili and Yakima River smoked sea salt butter. Portland is known as the "City of the Roses" so I made these into rose rolls instead of a loaf. Greek yogurt beer bread with hazelnut and malty aromas, topped with chili Yakima River smoked sea salt. Course #3 was a Mushroom and LSD soup. It sounds totally psychedelic, but only in taste - not in the mind altering way. I SOL-ed Squealed Out Loud early Saturday mushroom shopping at New Seasons Market seeing "Wild Hedgehogs." There were only 3 boxes left. I quickly grabbed one along with some Oregon criminis to make this soup: very, very intense because the only liquid added to it is beer. The LSD or Lompoc Strong Draft from Lompoc Brewery in Portland has a dark color with roasted, smoky notes to it. This soup was definitely not for the faint of heart - a true beer and mushroom lover's soup. For the fourth course, I prepared a beer braised locally made bratwurst using MacTarnahan's (Portland) Sling Shot Pale Ale. Oregonians love to celebrate their seasonal beers, and now that the winter brews are basically tapped out, the new spring beers are popping up everywhere. I selected Sling Shot Pale Ale, not only because it's a seasonal bring brew with a lively hopped flavor, but also because it's "mischievously good," just like sausage it. Oregon has strong German and Northern European roots, so sausage and beer is kind of obligatory - not to mention delicious. For the final course, I made mocha beer floats. Portland is a die hard coffee community so I wanted to include some caffeine into the tasting. I made salty chocolate ice cream using 70% dark chocolate and Oregon salt that my classmate, Jamie, made collecting salt from the tide pools and baking it in the oven. I poured Oakshire Brewing (Eugene, OR) Overcast Espresso Stout over the salty chocolate ice cream to form a mocha float. Overcast Espresso Stout is rich and smooth and paired well with the chocolate ice cream. The meal lasted about three hours and we finished by watching clips from the new series, Portlandia. (from left going around table to right) Jamie from LA, Batur from Khatzakstan, Colin from Washington, Heather from Gladstone, Diego from Ecuador, Camille from Boston and Matt from Portland. Outstanding, Anna. It's drizzling down here today for the first time in weeks, and I was already thinking about picking up some Black Butter Porter. This cemented that desire. Bravo to you, Despinis Abatzoglou on a delicious looking dinner. These "24" dinners are exhaustive but fun! JustinM - Thank you! Hope you enjoy that Black Butte Porter. What a menu! I love pairong food with beer, and those look like excellent brews! Jealous ... I submitted a proposal for this 24x24 and it wasn't accepted ... but I will admit your was infinitely better! Great recipes and it looks like you had a fantastic time. Have fun in Portland now! Alessandra - Thank you, and thanks for stopping by. I foresee more beer drinking in the future. Maria - What was your proposal?! Wow! what an impressive spread! And the residence pad looks like a fancy hotel inside! My husband would be all over this meal as he is a huge beer-drinker! I'm not a beer drinker at all but I love what you've created with the beer-influenced food...oh my, and the bread with the butters, yum!! I'm a huge fan of mushrooms and would have "squealed out loud" too at finding wild mushrooms at the Farmer's Market. I've been wanting to visit the state of Oregon for years however I don't drink coffee or beer. Do you think the locals will kick me out if they find out? LOL! Congratulations Anna for being selected by Foodbuzz. Everything you prepared looks and sounds amazing. Hats off, Anna! What a fantastic meal. Portland is so lucky to have you as a resident. You're doing the state proud! Helen - No coffee?! What, how did that happen? they certainly won't kick you out, especially since you make it up for the beer drinking with wine drinking I'm sure - we have some amazing pinots here. I haven't sought out any 1000 year old eggs yet... soon. Ivy - Thanks for your well wishes! Cathy - Ah shucks, blushings. Wow, seems like all of you really enjoy food. What a success event! Congrats great pictures this was a fun read as well! Helen - A great way to keep the carpet stain free! Smart girl. Glad you are my sister. I am the stainer sister. Pegasuselegend - Thank you and thanks for stopping by! Oh what a great idea to cook with beer! I love strange artisan beers and would really like to taste those ones. Great presentation too, your guests were very lucky. That's so great! I'd love to be able to buy those artisan beers. What gorgeous dishes! I love beer^in food. Ioanna - Thank you very much! Would you have liked strange artisan beers as much if you had never left Greece? I wonder... Not too many microbrews in the patrida, although I do love Mythos. Sounds like a fun themed evening! You are very creative in your dishes and your pairing. emiglia - Thanks, and oh wow I just saw your rabbit. That is amazing! This looks awesome! I've always wanted to do a beer pairing meal. 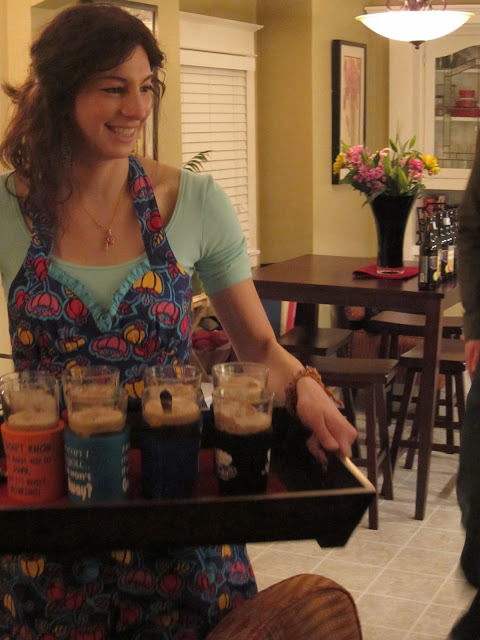 I love craft beers, and all the food you made to go with them looked delicious. Congrats on being chosen for 24x24! Courtney - Thank you so much!